Mish's Global Economic Trend Analysis: Obama's Trans-Pacific Partnership Fiasco vs. Mish's Proposed Free Trade Alternative; How Will TPP Function in Practice? Reader Richard asked me to comment on Obama's Trans-Pacific Partnership (TPP) proposal. For starters, it's one complicated mess. The Washington Post "Wonkblog" said in 2013 here's Everything You Need to Know About the Trans Pacific Partnership. If you're just now hearing about the Trans-Pacific Partnership, don't worry: It's not too late to get up to speed. Negotiations over the huge trade agreement — which, when finished, will govern 40 percent of U.S.' imports and exports — were supposed to wrap up this past weekend in Singapore, but, well, they didn't quite make that deadline, which means meetings will likely continue into the new year. The talks, as with all trade agreements, have been conducted largely in secret. Global health advocates, environmentalists, Internet activists and trade unions have deep concerns about what the deal might contain, and are making as much noise as possible in order to influence negotiations before a final version becomes public. Here's what you need to know. Basically, it's a giant free trade deal between the U.S., Canada, and 10 countries in the Asia-Pacific region that's been under negotiation for nearly a decade now (it began as an agreement between Singapore, Chile, New Zealand and Brunei before the U.S. took the lead in 2009). It's expected to eliminate tariffs on goods and services, tear down a host of non-tariff barriers and harmonize all sorts of regulations when it's finished early next year. The treaty has 29 chapters, dealing with everything from financial services to telecommunications to sanitary standards for food. Some parts of it have significant ramifications for countries' own legal regimes, such as the part about "regulatory coherence," which encourages countries to set up a mechanism like the U.S.' own Office of Information and Regulatory Affairs to conduct cost-benefit analyses on new rules. USTR has a rough outline, and for a more comprehensive rundown, read this Congressional Research Service report. 7. That doesn't tell me much. What are countries still fighting over? Since the negotiations are secret, it's hard to say precisely what the agreement contains (and that alone is reason enough to be suspicious of it). Nonetheless, many details have been leaked that give us serious concerns. 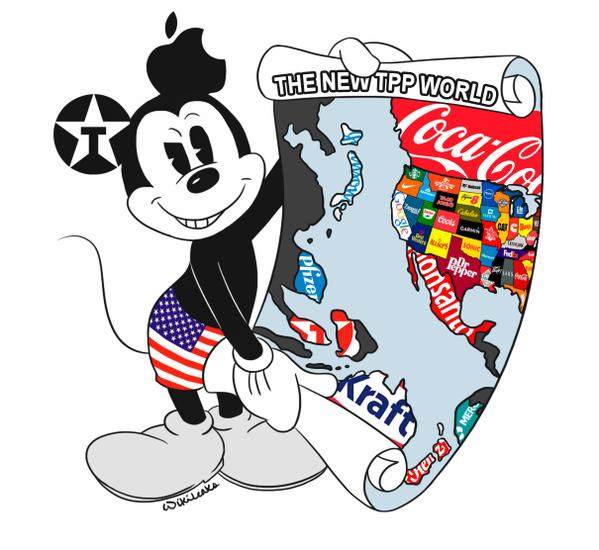 The Washington Post describe TPP as a "giant free trade deal". Leaks and disclosures show the Washington Post is way off base with that description. For example, the White House Blog says Environmental Advocates Point to the Trans-Pacific Partnership as a Historic Opportunity to Protect Our Oceans, Forests, and Wildlife. That paragraph all but ensures the framework will include a mass of costly global warming nonsense. Even if one agrees with global warming agenda, it does not belong in a free trade agreement. On March 27, 2015, the Huffington Post proclaimed Now We Know Why Huge TPP Trade Deal Is Kept Secret From the Public. A key section of the secret Trans-Pacific Partnership (TPP) trade agreement has been leaked to the public. The New York Times has a major story on the contents of the leaked chapter, and it's as bad as many of us feared. Now we know why the corporations and the Obama administration want the TPP, a huge "trade" agreement being negotiated between the United States and 11 other countries, kept secret from the public until it's too late to stop it. The section of the TPP that has leaked is the "Investment" chapter that includes investor-state dispute settlement (ISDS) clauses. WikiLeaks has the text and analysis, and the Times has the story, in "Trans-Pacific Partnership Seen as Door for Foreign Suits Against U.S.". The WikiLeaks analysis explains that this lets firms "sue" governments to obtain taxpayer compensation for loss of "expected future profits." Let that sink in for a moment: "[C]ompanies and investors would be empowered to challenge regulations, rules, government actions and court rulings -- federal, state or local -- before tribunals...." And they can collect not just for lost property or seized assets; they can collect if laws or regulations interfere with these giant companies' ability to collect what they claim are "expected future profits." Largely ignored by the media -- until now -- the TPP has been in a negotiation process for more than five years. The TPP has 29 "chapters" covering various issues, but only five of these chapters cover what would normally be considered "trade". These negotiations have been conducted in secret, but more than 500 corporate "trade advisors" have access to the text of the agreement. Many of the negotiators themselves are past (and/or likely expect to be future) corporate attorneys or executives. U.S. Trade Representative Michael Froman, for example, "received over $4 million as part of multiple exit payments when he left Citigroup to join the Obama administration," according to a report, "Obama Admin's TPP Trade Officials Received Hefty Bonuses From Big Banks," by investigative journalist Lee Fang. We have had five years of secret backdoor discussions on trade. The resultant document has 29 chapters of which only 5 are about trade. It's highly unlikely those 5 chapters have much to do with "free trade". TPP Opens Door for Foreign Suits Against U.S. The New York Times says Trans-Pacific Partnership Seen as Door for Foreign Suits Against U.S..
Julian Assange, WikiLeaks editor said: "The TPP has developed in secret an unaccountable supranational court for multinationals to sue states. This system is a challenge to parliamentary and judicial sovereignty. Similar tribunals have already been shown to chill the adoption of sane environmental protection, public health and public transport policies." Traditionally, the biggest blocks to global free trade deals have been the US and EU, and agricultural tariffs are often at the heart of the issue. The US typically says something to the effect of "we will agree to eliminate agricultural tariffs if the EU does", and of course France will never agree to let the EU do any such thing. "All tariffs and all government subsidies on all goods and services will be eliminated effective June 1, 2015." Pick your own starting date, including "immediately" if you like. Let the wrangling on all the other stuff take place elsewhere. Trade discussions ought to be about trade. History shows that alone is hard enough. Notice that I did not mention "fair trade". The only "fair trade" is "free trade" whether or not any other country reciprocates or not. I firmly believe the first county that fully embraces free trade would come out ahead, regardless of whether or not any other country reciprocates. From that standpoint, there is no need for discussion at all. The US could and should set the model for the world simply by ending tariffs and subsidies on its own accord. How TPP Will Function in Practice? If this damn thing passes as is, TPP will create an "unaccountable supranational court for multinationals to sue states", precisely what one might expect after five years of secret backroom deals led by Obama. Obama crammed down a bunch of global warming regulations. To get companies to go along, Obama concocted a supranational tribunal court that would allow every company to sue for lost revenue due to those regulations. Taxpayers will lose three ways: first on needless regulations, second on corporate handouts to pay for grievances, third for having to pony up for the creation of the new supranational court. I can smell boondoggles, and this one is massive. Q. Why did the deal take five years to put together? Obama had to win over every global warming group, no matter how extreme. Obama also had to include language for the explicit benefit of companies like GE that actively promote solutions that only "work" with huge government subsidies. GE's mission was to ensure subsidies would be big enough to make a fat profit no matter what happened down the line. Obama also had to appease companies that stand to lose from the hype. To get those companies on board, he had to create a supranational tribunal court. To get the lawyers on board, he needed their approval of the tribunal formulation and process. To get the Congressional ducks lined up, each sensitive group was shown only those things that were in their favor, while hiding everything else. I have an open mind about this. There is a slim chance I have it wrong. The way to prove me wrong is to release the full and complete text of the deal for the public to scrutinize. My fear is this will be another one of those things "you have to pass to find out what's in it". I submit my one sentence alternative a second time: "All tariffs and all government subsidies on all goods and services will be eliminated effective June 1, 2015." That's what free trade is really about, whether or not I am off base on some of my suspicions listed above.